In 2009 it was reported that all South Africa’s ideal org buildings had been purchased. Except of course Joburg North which was added later. “Oh Ja, we still have to get a building for Joburg North”. This building is yet to be purchased. Durban’s building was purchased in November 2007. You can read the News24 article on the purchase. The story of this building is rather interesting and I’m sure the back story is not broadly known. During this period of time Sea Org management were searching for ideal org buildings around the country. In Durban there was a building that Woolworths had been looking to purchase for around R5 million. They ultimately turned it down due to predicted parking problems. This building came to the attention of the church and they had to have it. However it had just been bought by someone else on auction for around R6 million. Despite being advised that there would be serious parking problems with the building the church insisted it would be perfect as an ideal org. They approached the new owners who made themselves the deal of a lifetime: The church purchased the building for R16 million! Of course all the money was not in place and money was required urgently so around this time the decision was made that all money raised for ideal orgs, no matter where or for which org, would go into one pool of “ideal org money”. This made it possible to use money raised for Joburg to be used by Durban. That’s exactly what happened. In Joburg R3 million had been raised for a new Test Centre. Joburg had announced this as a “done!”. That money was appropriated to help buy the Durban building. Without missing a beat Joburg was soon having additional fundraisers for the Test Centre, never explaining how this “done” was now “undone” other than to say building costs had gone up and that new work was needed to make it “ideal”. Once the building had been purchased, full plans were designed and created by Architects Gensler – a company based in Atlanta Georgia USA. Later these Architects were fired and the project was handed to a South African company – Bentel. Consultants for the various disciplines were then appointed for the project and they were paid to mark up the drawings for the various services such as Structural and Electrical Engineers, Air Conditioning, Electrical, Plumbing, IT and Quantity Surveying – amongst others. All of the above mentioned consultants were paid for their work on the Durban project and in effect “Phase 1” of the project was considered complete. To give an idea of what this would have cost, each discipline charges a percentage of the total value of the project as their consulting fee. It is estimated that an additional R2 million Rand was paid to all the consultants. The plans were then submitted to the Landlords office, and the next thing was in September 2010 application was made to demolish the building. When this was queried, the reasons given to the Consultants was that the renovations would cost more than building a new building from ground-up. , and also due to the age of the existing building there was a problem with the Fire rational Design (i.e. the fire escapes etc were not adequate for what they wanted to do to the building). 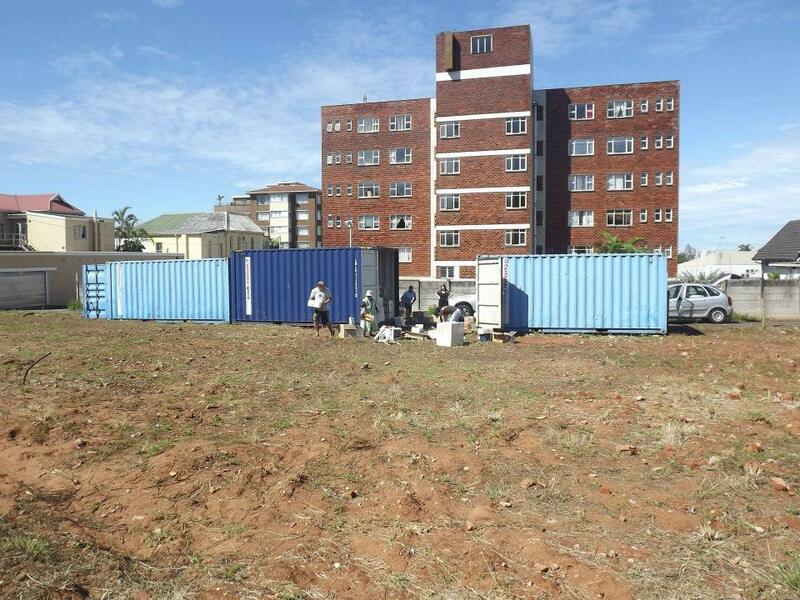 6 years after the purchase of the building all the field and management have to show for it is an empty lot for which Scientologists around the country (and the world) overpaid to the tune of R10 million. Meanwhile the poor staff and public of Durban are having desperate themed fund raisers to make the money necessary to build this building. Here’s a photo from their last fun filled event. Counting the photographer a grand total of 10 people gathered to reg money from each other. This entry was posted in Uncategorized by scnafrica. Bookmark the permalink. Excellent article and really good start on a South African Independent blog! I will add a link to our website so that our readers will know that there is true information coming out of SA. You might want to establish blog roll of sites that your readers might find interesting. Thanks very much David. We will most certainly add a blogroll in the next few days which will include your blog! Craig. I am not sure the field there knows this story properly. That is the beauty of blogs like this. I understand this org is a quiet place……..like so many others. are Ideal Orgs even on policy to begin with? I hear many Scientologists say that Ideal orgs are the sole creation of DM and it’s not anything Ron ever said to do. do members in good standing question the program to themselves? on a side note. I’m sure OSA is monitoring this blog. which means even more doubt is going to be put into those people’s minds as to what end they are actually serving. if you are doubting, you already know. come up to present time. you, that’s right you, that guy right there who’s reading this right now, you already know. Hello WhiteStar, there is a policy called “The Ideal Org” which states the ideal for any Scientology church. The fabrication is that it has to be done “right now” and paid for through donations of Scientologists. An Ideal Org as envisioned in this policy is something build over time through its own growth and industry. Google, IBM, Ford, Nestle, Clearwater Burger King, LRH, Churchill, Roger Federer, all know that you balance the size of your organization and it’s overhead with the strength of the demand for your products or services. Not the current management of orgs. No, they know better. Get the cash from your customers to build your company’s building, take the cash they are supposed to use on your services, saddle the company with huge local services costs and then promise them awesome services that never arrive. Pay the staff peanuts and keep replacing them as they leave to earn enough to stay alive, sell your services in advance, do not deliver, but use the cash to keep running even though you are building up more and more debt with your clients. Wild. Embarrassing and sad too. I have fallowed you back from my blog. 🙂 You might consider put my name in yours. David put the connection to mines as after Scientology and there is a connection to the Italian blog. People like to read what solo auditors do and their cognitions. In my blog there is over 200 basic-basic cognitions, every post written is from cognition. there are lots of visitors but of course it is up to you if you care to do that. My blog is not on ad. since I do not look for PS to audit. The blog is simply the journey of a solo auditor therefore her reality. Thank you for your time-attention. Best to you all. Elizabeth Hamre. This is a disaster. Money from the field given in good faith is misused in a cavalier fashion. The absolute disregard for the effort it takes by the field to generate R16 m of its own money. Simply trashed. This is enough to walk away from any ideal org fund-raising activities. Period. Unbelievable. If any executive in any company did this, they would be fired. No question about it. Source on this crazy scheme is Miscavige. (Not LRH. That is clear if you look at the references involved.) The management in SA just follows his lead, unquestioned. If LRH was around he would have some heads, that’s for sure. Great, eye-opening post! This blog looks great, the writing is top-notch, and the word is already out on Twitter as well as Mike Rinder’s widely-read blog. Greetings and sincere best wishes from Maine, USA! When the new Ideal Org is built, it will be more Ideal than any other Ideal Org — and that is saying a mouthful considering that the existing Ideal Orgs are so magnificently Ideal that they set a new standard in Idealness. Thank you for setting the record straight RTC! Would hate any misinformation get spread around by those SP squirrels and bitter defrocked apostates ….. Especially those on the fringes of the Internet. What would we do without you policing all this?!!! Thanks for exposing this. Even though this really gets my goat, I appreciate knowing the truth. The entire subject of Scientology revolves around integrity, honesty and truth. Not the least of which is the oft trotted-out quote “On the day we can fully trust each other, there will be peace on Earth”. I have to ask all of you – from Int Management who was pushing these orders down to the staff executing them – where the hell was YOUR integrity and honesty when you duped public like me with a straight face? Your hearts are as empty as that vacant lot, and just like the building you tore down, so you have done to my faith in you. The forlorn fundraising by public and staff for ‘ideal orgs’ happens here in Australia too. 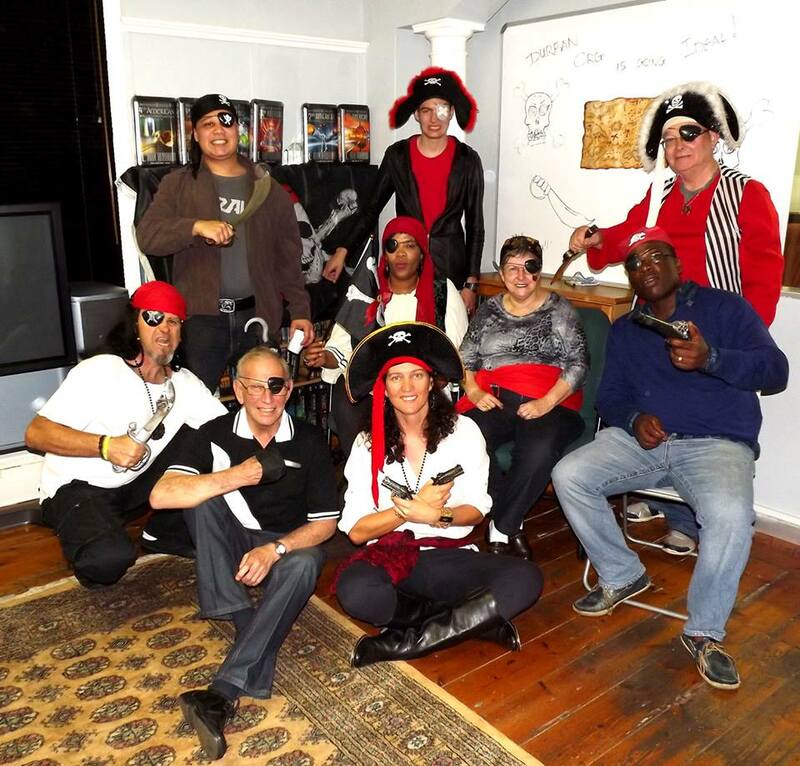 But the photo of the Durban folks in pirate costumes looks almost like they’ve gone into the valence of Anonymous and their operation Sea Aargh! of a few years back. A disgusting waste of other people’s hard earned money that was intended to do real good. There’s no one in charge with an ounce of business sense and it would seem this is now JUST business – no LRH. Durban’s Nick Howarth thinks he’s a talented comedian but really who is laughing? Forget the pirate hat, give the silly man a red nose. No need to attack anyone! Nick did his best and thats more than some of us can say… Lets focus on the real issue, the gradual and steedy usurpment of cash from unsuspecting inocense that should be going us the bridge, not morgaging their homes to please Ideal Orgs! I have given so much of my life to Scientology and despite all that I now know I still find it difficult to confront that as a group we have allowed this to happen. I find some solace in all the times I spoke up but I should have done more. I wish those around in the 80’s could have done more too – perhaps so much of this could have been averted. But I understand that there must have been immense pressure and that is where we give in. Pressure we put on ourselves to achieve spiritual awareness before it is too late. Pressure from the powers that be who insist all is well and encourage us all not to look. Pressure from each other to just keep going. But we’ve all noted the outpoints. We’ve all spotted the insanity of orders/requests. We’ve all turned a blind eye when someone was ridiculed for speaking up. We all have our own responsibility. My personal experience is that I can no longer trust what the staff and Sea Org say – if you think we have pressure…..and I hope someday they look for themselves too. I owe it to myself to LOOK! It’s time I grow up and realise that I need to raise my level of confront…..as we all need to in good ol’ South Africa. Thank you for this blog and from what I’ve read so far it is just stating the data…no HE&R. I have observed some of what you have mentioned too. Perhaps someday we’ll have our own TRC! I hope so. And here, from the stable of “Blackbeard Fashions”…..is what your trendy and in character Ideal org member will be wearing this summer. Inspired by the livery of the 15th and 16th century sea rovers who worked tirelessly to loot and pillage the hardworking merchant ships of the 7 seas at the time, the in vogue member will don “buccaneer black” trimmed in white and topped with skull and crossbones and matching eye patch. Accessorized with one’s weapon of choice – muskets, pistoleros, cutlass and dagger, the model would be able to carry out his business of plunder with stylish aplomb. This is insane. The title deeds of the buildings must be registered locally and the bank accounts controlled locally too. The church had better watch out for a revolution when the big donors find out about this. The church has made the Bridge to Total Freedom become A Bridge Too Far. Quick question. What would be the approximate (real world) value of the now empty lot? A good question Panda and one don’t actually know the answer to. We will endevour to find out! Congratulations to the originators of this website. It is clearly part of the inevitable renewal taking place worldwide. What is happening is not some ill-advised revolution by a bunch of misguided malcontents. It is a most natural response born out of the essence of “what” we are. Call it theta if you wish, I personally use the term consciousness. Anyway, consciousness (theta) is creation. Consciousness is present to the degree creation is taking place. Whether we are aware of it or not, we are constantly creating the self we believe we are. Throughout history empires and civilizations have come and gone. In each case growth occurred as long as creation was prevalent. The point of decline started when “creation” was inhibited in one way or another. The Church of Scientology has gone the same route. In the simplest of terms, the promise and sense of creation inherent in Scientology organizations in earlier days – as experienced by individuals – have been subverted by a prescriptive and controlling system. In other words, that most essential aspect of consciousness (theta) – creation – has become a no no. This goes against the fundamental dynamics of existence and as such is destined to fail – renewal is inevitable. . Extreme buy-in into a collective mindset inevitably replaces individual creativity and contribution with ‘group think’. This is when individuals lose their personal sense of ownership and no longer take individual responsibility for prevailing circumstances. Consequently, humanity—the nation or group—is denied the unique creative perspective of the individual. We have too often seen that whenever large numbers of people hand over mind, body and soul to the Cause, the Faith or the Fuehrer, the outcome has been disastrous. Extreme herd mentality and a lack of personal accountability for prevailing circumstances are prominent features of the darkest chapters in human history. LRH was well aware of this threat, hence the reason for the Qual Division. I was fortunate enough to get the true sense of the intent behind Qual when personally hated by LRH at St Hill as Qual sec when Qual first appeared on the Org Board. In my various one on one discussions with LRH, while I was captain of the Athena and Apollo, I came to understand that the idea of standard tech was never meant to prevent further development and evolution of the tech and organization. Yes, there are periods when consolidation should be the priority, as was LRH’s intention in the last years of his life. But as we can see, the current COB – DM, has taken “consolidation” way beyond the time for renewal. I am not surprised at all by the latest developments within the Scientology community. . . When I was “in” I had a rather cool respect for LRH. I thought he came up with some clever stuff, but the “too good to be true” personality put out by the RCS didn’t sit very nicely with me. I know many people coming out, reading other stuff about LRH are appalled. I, on the other hand, have become fascinated by this “new” (new to me) multidimensional personality. I am not concerned that he had faults – we all do – but I would just love to hear any anecdote that you may have which could reveal who he really was deep down. I would also be intrigued to learn how you ended up getting out, but of course, I don’t want to press that if it is private. I just wanted to communicate my strong interest in whatever gems you may want to share. We would like to echo this statement Joe. We’re sure you would make a valuable contribution to this conversation. I guess it is to be expected that the founder of something like Scientology will be elevated to a status which reflect the hopes and aspirations, wishes and fantasies of devotees. And as evidenced throughout history, who the founder actually was is increasingly lost sight of with the passing of time. During my involvement with Scientology and since, it dawned on me that not everyone was, or is, having the same experience – in some cases not even close. The same applied to the relationship with LRH, whether up close and personal or at a distance. LRH interacted up close and personal with several individuals at various stages of Scientology’s evolution and no doubt everyone have their own story to tell. . Initially when I first came into Scientology my relationship with LRH was “at a distance” so to speak. I saw him as more than human. But while on staff at St Hill in the mid 1960’s and particularly during the early years of the Sea Org my relationship with the old man became up close and personal. I got to know the man. And he definitely had his flaws – some of which will be unequivocally denied or “blocked out” by the current crop of devotees. It may be possible to cover up a variety of bad judgment calls and character flaws in a typical corporate environment, but at sea, handling ships in an unpredictable, unforgiving environment the good, the bad and ugly in people is almost impossible to hide. In such an environment keeping up pretences becomes far less relevant. It was in such an environment that many came to get a deeper insight into LRH the man. In my personal experience, during this time, I had little doubt as to who I was dealing with. When LRH was angry he let you know in no uncertain terms, when he was sick he was sick and behaved accordingly. When he was confused it was reflected in his behavior. .But also, when he appreciated what you had done he let you know, even if it was just a whisper in your ear saying, “what would I do without your shoulder to lean on”. Should the theme of your discussion be woman during a one on one conversation, depending who you are, he would express how he really felt with no ought to be’s. For instance, in one such conversation he said to me; “you know Joe, the grey hairs on a man’s head when he is old are not the one’s he did but the one’s he didn’t”. This was in reference to bedding woman in case the point was missed. I certainly can not abide by labels of conman in reference to LRH. Whether one agrees with his approach to unraveling the mysteries of the mind or not, I personally believe he was first and foremost in search of answers – answers to his own case as well as, what he perceived to be, answers fundamental to all of existence. His contribution in this regard can not be denied. I do not agree that his work is the final word on the matter, but the idea that he was essentially out to enrich himself is ludicrous. As I see it some philosophical (tech) and organizational judgment calls made by the old man were flawed. Yet, in retrospect, it could probably not have been otherwise when viewed within the context of comparable evolution and developments in medicine, most religions and politics. Leaving aside my assumed flaws in the philosophy for now I will point out what I believe to have been a serious error in judgment organizationally. There was a point, leading up to the birth of the Sea Org, when LRH made some decisions which amounted to the replacement of Qual by ethics – the replacement if the review auditor by the ethics officer. Qual’s correction function was, to all intents and purposes, taken over by ethics. This single action put Scientology on a “different” course, which became increasingly obvious with the passing of each year. At the point when I realized the C of S was no longer the organization I originally joined I decided it was time to move on. On the day I walked of the Apollo’s gangplank for the last time I was stopped by the LRH com and handed a personal letter from LRH, Suffice it to say it was confirmation of mutual respect. Thank you Joe – I really appreciate your post. What you say mirrors very much what Mike Rinder and Sinar Parman say. They also knew him well. It is very gratifying to me to know that, at the core, whether his set up of the organisation was right or wrong, or how far the tech take’s one, he was a “well-intentioned” person. That’s my take on it having regard to everything I know so far. Thank you again. I loved the anecdote about the gray haired men. It certainly a far cry from the attitude of the church today. Pingback: Church of Scientology Facing Critical Situations in South Africa | OTVIIIisGrrr8! I’m from the US, and I’ll say that the architecture job should NEVER have been given to a US company. Reason #1: Terminology and requirements. U.S. companies couldn’t possibly know the rules, regulations and requirements that prevail in Durban. Plus, a “widget” in the U.S. may not mean the same thing at all in South Africa. Reason #2: Providing this job to a local (Durban) company is a move which can be capitalized on in a PR way later. Reason #3: Providing this job to a local (Durban) company is good for the local economy. If the Church wants to be a good neighbor to the locals (always a benefit), one of the best ways is to do as much business as you can with as many local companies as you can. This supports them and allows them to see that you don’t make unreasonably demands (don’t) and that you pay your bills on time (do). And that you’re (Scientologists) not all wild-eyed and crazy, like they’ve probably been told.